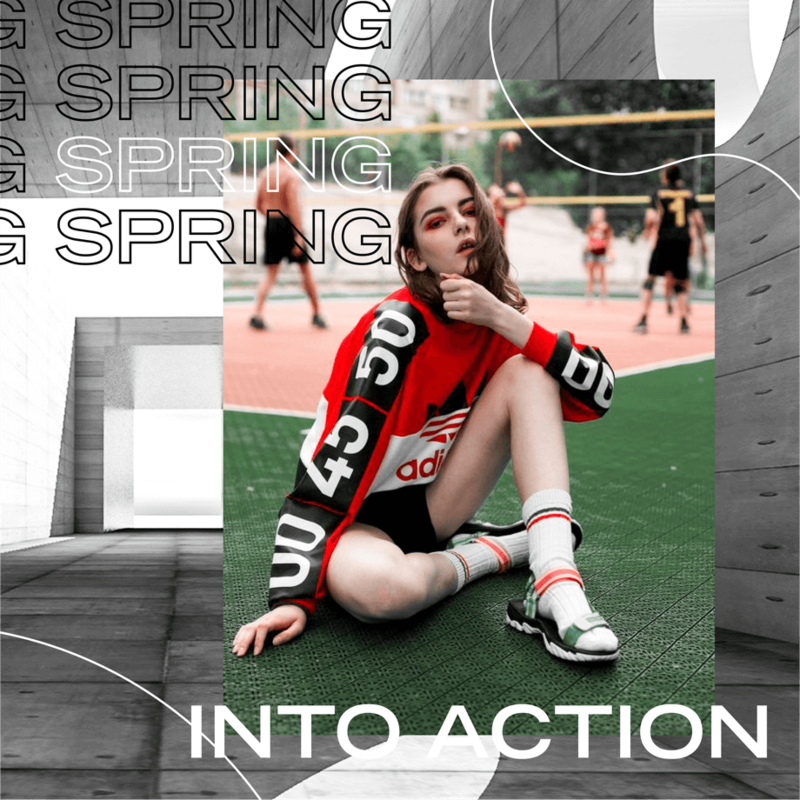 Spring into Action is a branding campaign, led by Fumi Omori of Sagmeister & Walsh, designed for Adidas’ hypothetical spring collection called Spring into Action. 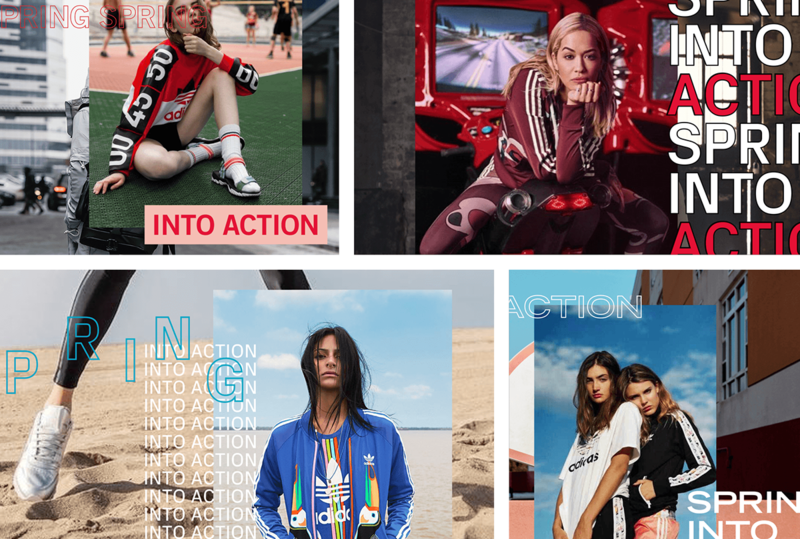 The process began by researching the brand and exploring the possibilities of a spring campaign and then, developing a proposal deck for the campaign with two directions. After a visual direction was chosen and finalized, I mocked up in-situ applications and created a brand guideline that could be applied to print, social media, and other applications. 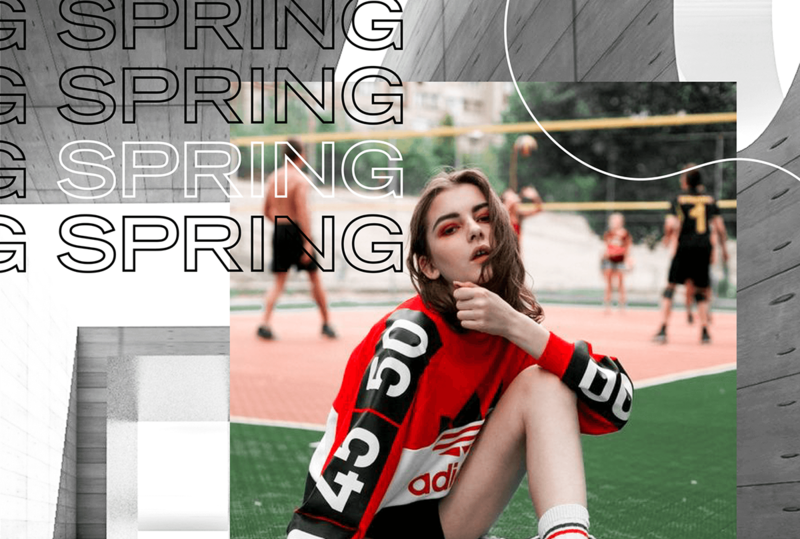 I researched Adidas’ existing brand strategy to inform my work and compiled moodboards to explore potential aesthetics. Wanting to depict a different look and feel from their yellow and blue gradient campaign visual right now, I set out to define a type heavy, bold, fashion-based, simple design direction. I came up with two main tag lines for the directions. With this direction, I explored a bold, strong, grunge visual language, focusing on a fashion-based visual with effective photography. This system incorporates sans serif typefaces that is repeated for an enhanced visual effect. I experimented with overlayed images and type, different type treatments and various compositions. 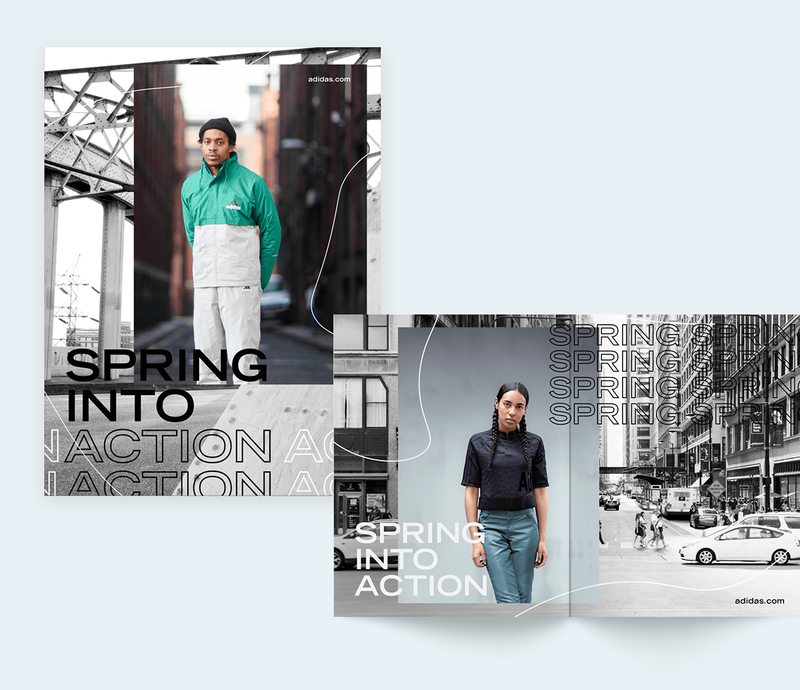 For the complete opposite direction, I wanted to create a campaign that was more of a spring and light feel. I explored more with collaging the images and applying light color fields on the studio fashion images. With the tagline combined with the movement of the models, it compliments the tag line I’ve created for the campaign. In order to further develop the dynamism, I incorporated fun little blobs that could be filled or outlined to play alongside the design. After selecting direction one and developing it further, I defined the typographic palette to be black and white, and bold, to embody the grunge aesthetic. Using trade gothic extended, it employs all-capital sans serif letterforms in regular and outline styles that can contrast with the highly-saturated photography. 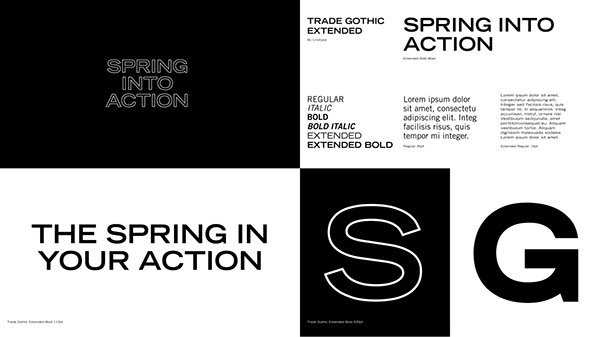 For the final design system, I fine-tuned the design and created rules for the Spring into Action’s visuals. The final design system is comprised of a fashion image layered over black and white cityscape photograph. A black or white repeated tagline adds dynamism and texture when overlapped on the fashion image. Graphic lines complements the composition, always touching the edges. 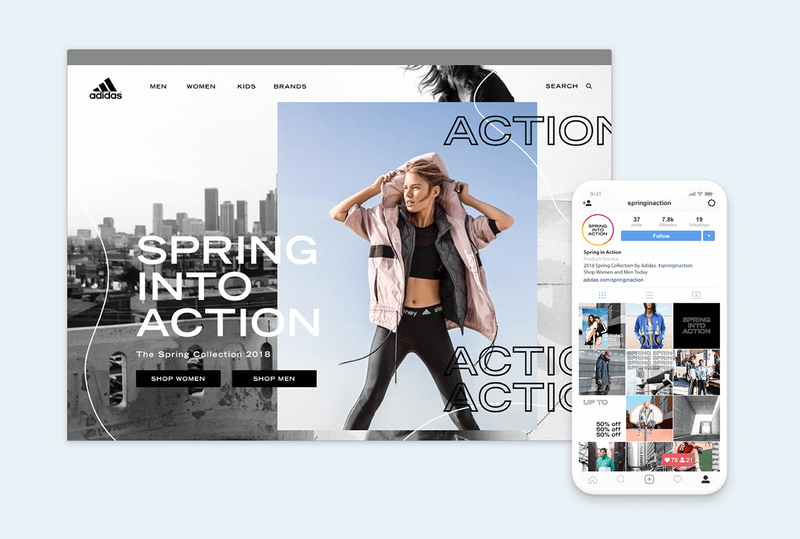 A consistent art direction scheme is applied to all applications and dimensions, including social media campaign. 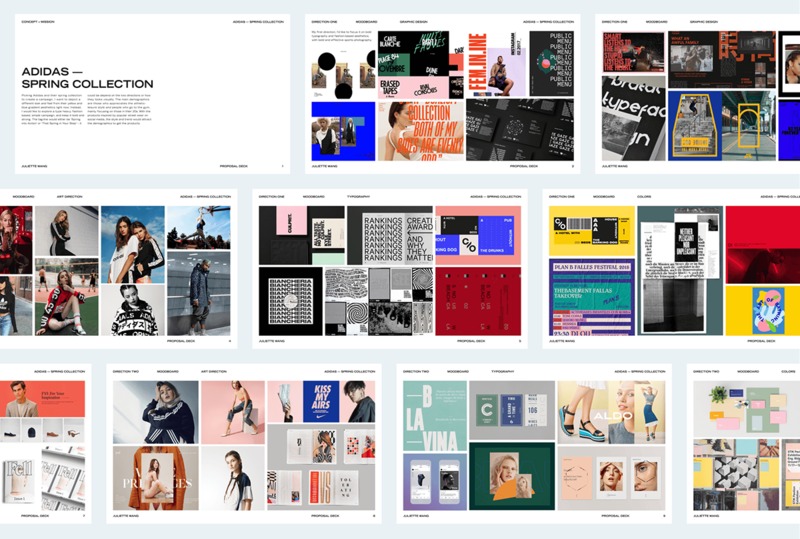 The Instagram feed is curated with a cohesive set of text, color fashion photos, black and white building photos, and one that satisfys the design system. 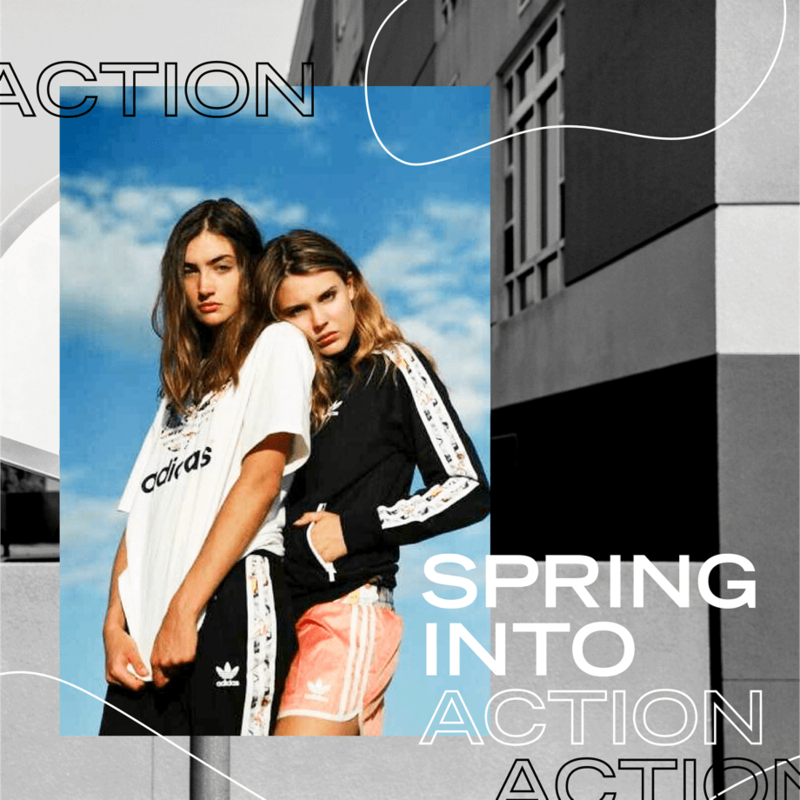 This branding campaign, led by Fumi Omori of Sagmeister & Walsh, was designed for Adidas' hypothetical spring collection called Spring into Action. After developing a visual direction and concept, I mocked up in-situ applications, and created brand guidelines that could be applied to print, social media, and other applications.